The resignation of Most Rev Michael Kpakala Francis (pictured left) as Archbishop of Monrovia, Liberia, has been accepted by Pope Benedict XVI, in an announcement from the Vatican on 12 February 2011. Though ill for several years the Archbishop’s resignation came as he reached the mandatory age for retirement and was in accordance with canon 401 § l of the Code of Canon Law. He was ordained as Vicar Apostolic of Monrovia in December 1976, succeeding Most Rev Francis Carroll SMA (from Newry, Co Down). In 1981, Monrovia was raised to the status of an Archdiocese with Cape Palmas as its suffragan diocese. Archbishop Francis was, even at the darkest moments in Liberia’s recent history, a man of peace. Though his life was often threatened by the different groups engaged in Liberia’s civil war the Archbishop refused to trade insult for insult. He always spoke of reconciliation and worked tirelessly for it until the moment when he was struck down by a stroke several years ago. After recuperation in the USA and the SMA House in Cork he returned to his beloved Monrovia where he now lives. 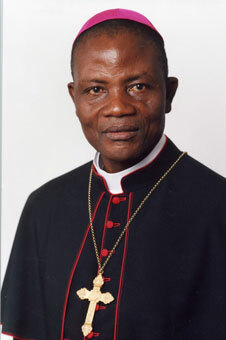 Archbishop Francis is succeeded by his Coadjutor Archbishop, Most Rev Lewis Zeigler who was, until his appointment as Coadjutor, Bishop of Gbarnga, Liberia. This change in the Liberian Episcopal Conference comes just over a month after the appointment of Rt Rev Andrew Jagaye Karnley as Bishop of Cape Palmas, in succession to Bishop Boniface Nyema Dalieh.